Autonomous systems and focused startups among major changes seen in past year. Download our free report, The Future of Machine Intelligence, and see where machine learning goes from here. 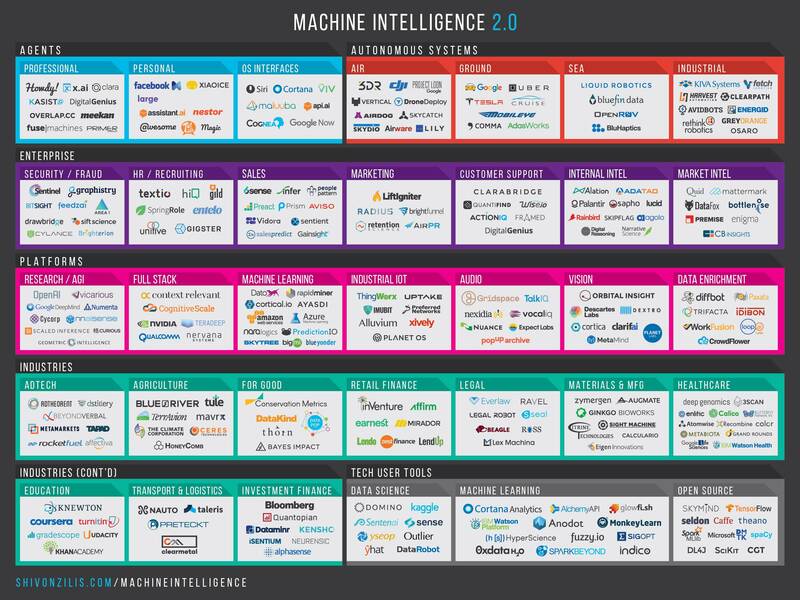 For additional insight, see "The current state of machine intelligence 3.0." With the focus moving from “machine intelligence as magic box” to delivering real value immediately, there are more ways to bring a machine intelligence startup to market. (There are as many ways to go to market as there are business problems to solve. I lay out many of the options here.) Most of these machine intelligence startups take well-worn machine intelligence techniques, some more than a decade old, and apply them to new data sets and workflows. It’s still true that big companies, with their massive data sets and contact with their customers, have inherent advantages—though startups are finding a way to enter. In last year’s roundup, the focus was almost exclusively on machine intelligence in the virtual world. This time we’re seeing it in the physical world, in the many flavors of autonomous systems: self-driving cars, autopilot drones, robots that can perform dynamic tasks without every action being hard coded. It’s still very early days—most of these systems are just barely useful, though we expect that to change quickly. On one hand, these agents can act utterly professional, helping us with customer support, research, project management, scheduling, and e-commerce transactions. On the other hand, they can be quite personal and maybe we are getting closer to Her — with Microsoft’s romantic chatbot Xiaoice, automated emotional support is already here. At least I make myself laugh. Big companies like Google, Apple, and IBM are seeking out these opportunities because they have the resources to be patient and are the most likely to be able to effect regulatory change—their ability to affect regulation is one of their advantages. I remember reading Who Says Elephants Can’t Dance and being blown away by the ability of a technology icon like IBM to risk it all. (This was one of the reasons I went to work for them out of college.) Now IBM seems poised to try another risk-it-all transformation—moving from a horizontal technology provider to directly transforming a vertical. And why shouldn’t Watson try to be a doctor or a concierge? It’s a brave attempt. In the machine intelligence world, founders are selling their companies, as I suggested last year—but it’s about more than just money. I’ve heard from founders that they are only interested in an acquisition if the acquirer has the right data set to make their product work. We’re hearing things like, “I’m not taking conversations but, given our product, if X came calling it’d be hard to turn down.” “X” is most often Slack (! ), Google, Facebook, Twitter in these conversations—the companies that have the data. Until recently, there's been one secret in machine intelligence talent: Canada! During the “AI winter,” when this technology fell out of favor in the 80s and 90s, the Canadian government was one of a few entities funding AI research. This support sustained the formidable trio of Geoffrey Hinton, Yoshua Bengio, and Yann LeCun, the godfathers of deep learning. I can’t wait to see more combinations of the practical and eccentric. A few years ago, a company like Orbital Insight would have seemed farfetched—wait, you’re going to use satellites and computer vision algorithms to tell me what the construction growth rate is in China! ?—and now it feels familiar. Overall, agents will become more eloquent, autonomous systems more pervasive, machine intelligence more...intelligent. I expect more magic in the years to come. Many thanks to those who helped me with this! Special thanks to Adam Spector, Ajay Agrawal, Beau Cronin, Chris Michel, Chris Nicholson, Dan Strickland, David Beyer, David Klein, Doug Fulop, Dror Berman, Jack Clark, James Cham, James Rattner, Jeffrey Chung, Jon Lehr, Karin Klein, Lauren Barless, Matt Turck, Mike Dauber, Morgan Polotan, Nick Adams, Pete Skomoroch, Roy Bahat, Sean Gourley, Zavain Dar, and Heidi Skinner (who designed the graphic). Article image: Cartographical representation of a self-organizing map based on Wikipedia featured article data. Distance is inversely proportional to similarity. The "mountains" are edges between clusters.. (source: By Denoir on Wikimedia Commons). Shivon Zilis is a partner and founding member of Bloomberg Beta, an early-stage VC firm that invests in startups making work better, with a focus on machine intelligence. She's particularly fascinated by intelligence tools and industry applications. Like any good Canadian, she spends her spare time playing hockey and snowboarding. She holds a degree in economics and philosophy from Yale.